We all belong to groups or teams; being in a group is part of everyday life. Although the two terms group and team both refer to a number of people who share a common characteristic, there is a slight difference between group and team, especially in a management and business context. The main difference between group and team is that the members of a group share common characteristics whereas members of a team share a common goal or purpose. A team is a group, but not every group is a team. The term group has a broad meaning. It refers to a number of people who are connected by some shared activity, interest, or quality. Group can also refer to a number of people or things that are together or in the same place. Groups may be brought together for a particular purpose, or they may be informal such as a group of friends, neighbors, colleagues, etc. Although individuals in a group have common characteristics, they may not have a common goal or task. For example, a group of students in a class has a common feature – they all have come to learn, but these students are not necessarily working towards a common goal. 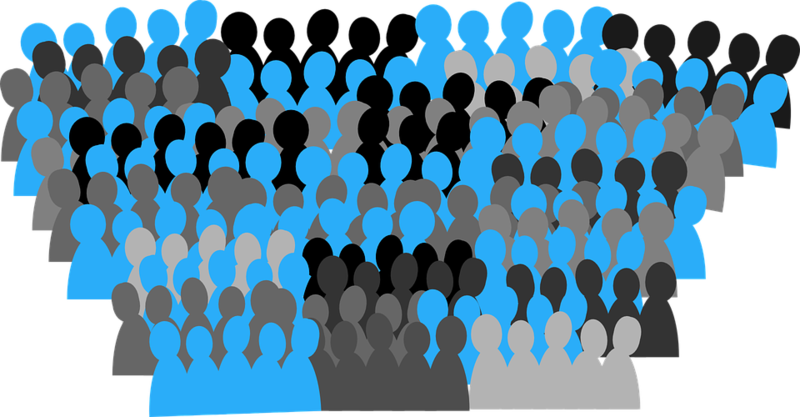 Similarly, the term group is also used to refer to the people who belong to an ethnicity, or religion. Although the people in these groups share common characteristics, there is no shared cause or goal. The absence of a specific, shared goal or purpose is a main factor that differentiates a group. Moreover, the members of a group are independent; they do not rely on each other since roles and responsibilities are not assigned to each member. Team refers to a number of persons associated together in work or activity. Members of a team work together towards a common goal. They have to coordinate the tasks and activities to achieve this shared goal. The roles and duties are defined and specified in a team, i.e., each member is assigned a specific task. Members of a team are interdependent since each member is responsible for a certain task. If one task or duty is not done properly, it may affect the whole activity or task. In addition, members of the team usually have a good awareness of each other’s characteristics. In other words, there is mutual understanding between team members. This attribute helps to maximize the strengths and minimize weaknesses in the team. Some examples of teams include research and development teams, fast food restaurant crew, product development team, soccer team, etc. A team can be categorized as a group, but not every group is a team. Group: Group refers to a number of people who are connected by some shared activity, interest, or quality. 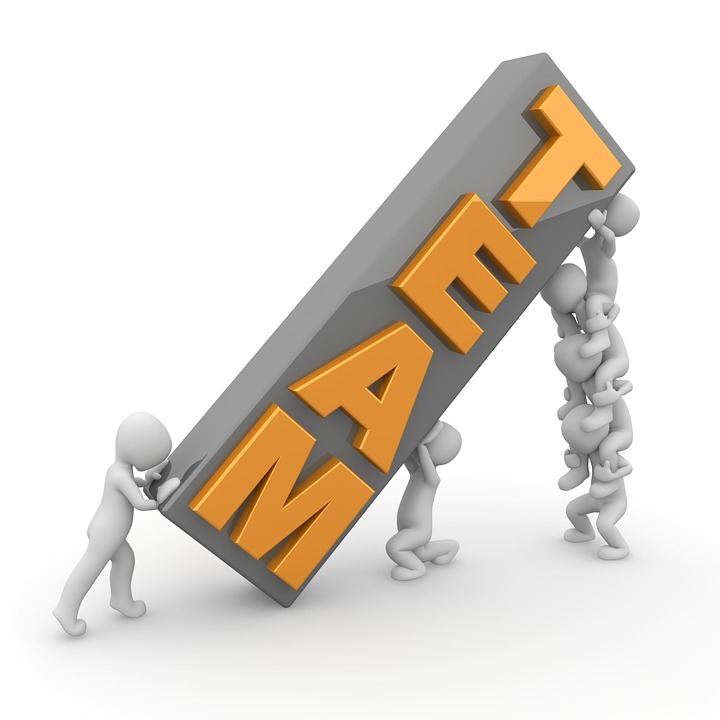 Team: Team refers to a number of persons associated together in work or activity. Group: Group members may not share a common goal. Team: Team members have a common cause or goal. 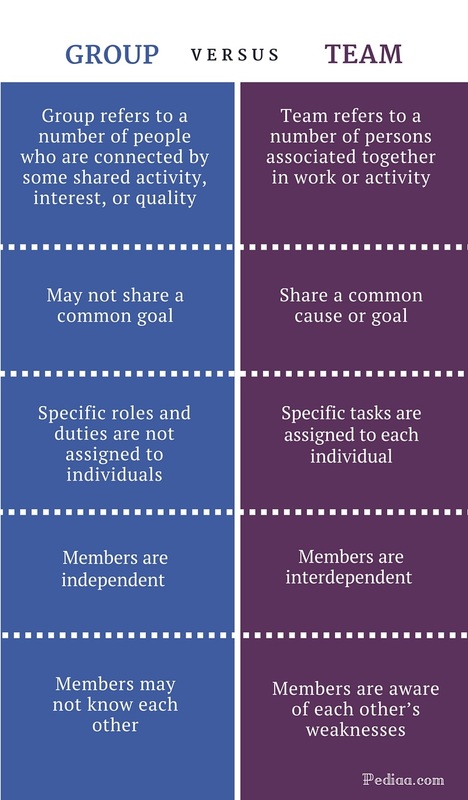 Group: Specific roles and duties are not assigned to individuals. Team: Specific tasks are assigned to each individual. Group: Group members are independent since they do not rely on each other. Team: Team members are interdependent since different roles are assigned to different people. Group: Group members may not have even seen each other if the group consists of many people. Team: Team members are usually aware of each other’s weaknesses.